The study design includes prospective evaluation of percutaneous osteosynthesis associated with cement kyphoplasty on 18 patients. The objective of the study is to assess the efficacy of a percutaneous method of treating burst vertebral fractures in patients without neurological deficits. Even if burst fractures are frequent, no therapeutic agreement is available at the moment. We report in this study the results at 2 years with a percutaneous approach for the treatment of burst fractures. 18 patients were included in this study. All the patients had burst vertebral fractures classified type A3 on the Magerl scale, between levels T9 and L2. The patients’ mean age was 53 years (range 22–78 years) and the neurological examination was normal. A percutaneous approach was systematically used and a kyphoplasty was performed via the transpedicular pathway associated with percutaneous short-segment pedicle screw osteosynthesis. The patients’ follow-up included CT scan analysis, measurement of vertebral height recovery and local kyphosis, and clinical pain assessments. 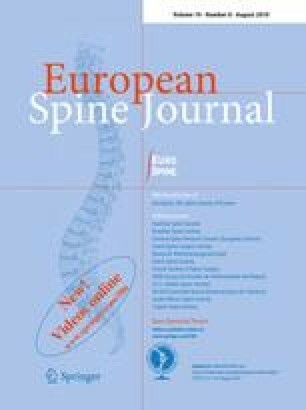 With this surgical approach, the mean vertebral height was improved by 25% and a mean improvement of 11.28° in the local kyphotic angle was obtained. 3 months after the operation, none of the patients were taking class II analgesics. The mean duration of their hospital stay was 4.5 days (range 3–7 days) and the mean follow-up period was 26 months (range 17–30 months). No significant changes in the results obtained were observed at the end of the follow-up period. Minimally invasive methods of treating burst vertebral fractures can be performed via the percutaneous pathway. This approach gives similar vertebral height recovery and kyphosis correction rates to those obtained with open surgery. It provides a short hospital stay, however, and might therefore constitute a useful alternative to open surgical methods.